Not surprisingly, 19 species of gulls have been seen at Montrose. 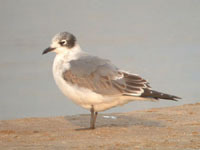 Laughing Gulls are regular, especially in the spring, and Franklin's Gulls are regular in the fall. Occasionally, large numbers of Franklin's are seen along the lakefront in late October and November when there is a strong west wind. Thayer's, Great Black-backed, and Glaucous Gulls can be found in late fall and winter, and Iceland Gulls are also sometimes seen. Though less common in recent years, Lesser Black-backed Gulls can be found at almost any time of the year. 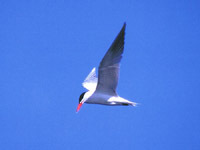 Of the terns, Caspian is regular from April to September, with the largest numbers occurring in late April and early May. In May and again in August and September, Common and Forster's Terns can be seen migrating along the lakefront or even roosting on the beach with gulls. Though much rarer now than in past years Black Terns are sometimes seen, particularly in late summer.